According to NAMI (the National Alliance on Mental Illness) more than 10 million people have bipolar disorder. If you’re like most people, you probably assume that you have a basic idea of what the disease is about. You’ve seen or read about celebrities who have acknowledged their illness. Some of you may know that Demi Lovato learned in 2010 that she is bipolar. Ms. Lovato also has struggled with an eating disorder, depression, and addiction; disorders that often go hand in hand with bipolar disorder. Carrie Fisher, who played Princess Leia in the original Star Wars, struggled with drugs and alcohol for years before she learned that she is bipolar. Jean-Claude Van Damme has revealed that he has bipolar disease and noted that it is under control because of medication. Catherine Zeta-Jones revealed in 2011 that she has bipolar II. For all the publicity surrounding the disorder, there are many facts that are simply not known. Here are the top six that I’ve noticed as a therapist. 1. FICTION: When people with bipolar disease are manic, they are always happy and energetic.FACT: Mania can often come out looking like anger and rage, or being irritated and edgy. I’ve had clients describe their mania as “painful,” “feeling out of control,” or “reeling with emotion.” Mania can ruin relationships. It’s like a runaway train that threatens a person’s work, family, and livelihood. 2. FICTION: Bipolar disorder consists of two states: manic and depressed, and people go between these two states without a break. FACT: With both bipolar I and bipolar II, there is a middle space where a person is not manic/hypomanic and not depressed. Some people will switch rapidly from manic to depressed and back to manic, while others can go from one extreme to a more middle, healthier state. 3. FICTION: Bipolar disease causes everyone’s moods to switch dramatically throughout the day.FACT: The reality is that some people stay depressed or manic/hypomanic for months, if not a year or more. This is one reason that bipolar disease is often missed for years and people are misdiagnosed as having major depressive disorder. 5. FICTION: It’s impossible to live a happy, normal life with bipolar disease. FACT: People who are diagnosed with bipolar disorder can have wonderful relationships and a happy, fulfilling life. What is crucial is identifying that a person has the disease and finding a treatment or treatments that work. Treatment could involve mood stabilizers, examining lifestyle components such as building or rebuilding relationships, diet, exercise, and stress reduction. 6. FICTION: Bipolar disorder consists of two moods – depressed and manic. 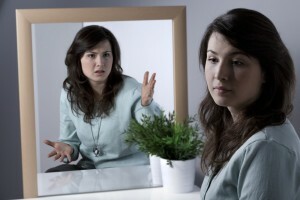 FACT: Bipolar disorder comes in two categories: Bipolar I and Bipolar II. Bipolar I is what most people think of when they hear the word bipolar. Bipolar I has mania as one of its criteria. This mania is severe enough to cause serious problems in the life of the person who has it. When someone is manic, they may do things that end up being harmful, such as risky sexual behavior, repeatedly spending much too much money on items that are not needed or cost more than the person can afford. Bipolar II consists of hypomania and depression. Hypomania is the state where a person’s mood fluctuates greatly, but it is not severe enough that their lives are drastically disrupted. There is a great deal that we don’t know about bipolar disorder, but there are some very effective treatments, and research continues to find newer medications and treatments to help. There is hope out there.